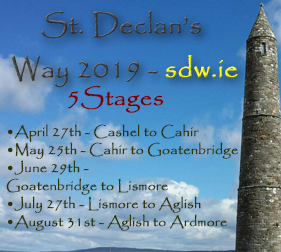 2019 is the year when the 104km long St. Declan’s Way Pilgrim Path from Cashel to Ardmore (or Ardmore to Cashel, depending on which way you choose to approach it) is fully waymarked. 2018 marked the re-opening of the route – so things are really happening along this ancient Pilgrim Path. To mark the occasion, and in association with Pilgrim Paths Week 2019, the Knockmealdown Active group is organising a five stage guided walk of the entire route. The quintet of walks starts on Saturday, April 27th. To facilitate those wishing to take part, the walk will not be over consecutive days but in 5 Stages on the last Saturday of April, May, June, July and August. For most people this will means no time off work for a historic chance to be part of the first group to walk this restored route once it has been fully waymarked. Fourth Stage: July 27th – Lismore to Aglish (park in Aglish, bus to Lismore, walk to Aglish). Fifth Stage: August 31st – Aglish to Ardmore (park in Ardmore, bus to Aglish, walk to Ardmore). No dogs allowed – unfortunately we are not in a position to cater for them. The payment covers buses to take walkers from their cars to the walk start, team leaders and medics on hand during the event. It also includes food at the beginning and end of each stage. Walkers should make sure to bring snacks and drinks for the duration of the walk. Any accommodation participants may need is not included in the event price. If you are booking accommodation be sure to book it at the destination for the day’s walk, otherwise you will have to organise transport to bring you back to where the walk began, e.g. for stage one on April 27th, book accommodation in Cahir, not Cashel (the buses will leave from the Cahir Castle car park and the walk will return to Cahir in the afternoon). You can find a list of available accommodation along the route on this link. Note, this accommodation list is not vetted or promoted by Knockmealdown Active in any way, it is simply provided for the convenience of those who may need the information. Keep up to date with both Knockmealdown Active at @KMDActive and St. Declans Way at @StDeclansWay, on both Twitter and Instagram platforms using the hashtags #StDeclansWay and #PilgrimPaths. Tickets are available to purchase using the link below. Each stage costs €25 with a Early-Bird discount for the first 100 people to book all 5 stages, which will cost €100 until these tickets are all gone. Unfortunately, the early bird discount offer places are now full.